I’m very excited to announce that I am now offering a photography workshop in Costa Rica! 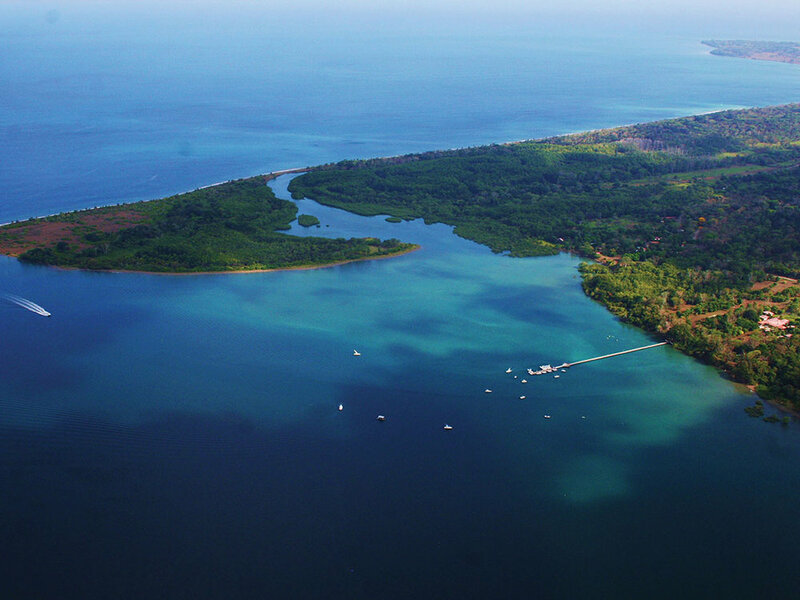 The area the workshop will take place in, known as the Osa Peninsula, is one of the most bio-diverse places on the planet! To quote National Geographic, they have called it "the most biologically intense place on earth". I will be co-leading this workshop with Sean Lo, http://seanlophotography.com/ who is an incredibly talented professional wildlife photographer. Having 2 instructors is a unique opportunity to ensure everyone has all of the attention needed giving you the best opportunity to get the shots that matter most! Dates: November 14-22 2019 - This workshop takes place in November 2019 (7 full days onsite and 2 travel days) which is just after the rainy season has ended but starts just before the peak season therefor prices are lower, the majority of the rain is done (though there is always potential for rain which makes for great photos!) and the area is not crowded with tourists. The resort also only allows one workshop at a time so that there is no competition for wildlife spots and resources which is a great bonus for us! Pricing and signup info at the bottom of the page. What to Expect: Before I get into the day by day itinerary I want to give you a high level overview of the trip. While in Costa Rica we will be hosted by Crocodile Bay Resort which I can’t say enough great things about. On the grounds of the resort alone I saw countless species of birds, lizards, monkeys and even a sloth! I could have been happy spending my entire trip just on the property! Along with that, the staff here is simply amazing! They are beyond friendly and make you feel like you’ve known them forever. The food is also world class. The area is known for being one of the best fishing areas in the world so there is no shortage of seafood. Finally, one of the most important elements to having a successful trip is the guide that will be taking us out each day. As abundant as the wildlife is here, many of the species are designed to blend in. For as many nice things as I have to say about the resort, I could say twice as much about how amazing the guides are. Besides being incredibly knowledgeable, friendly and masters of spotting wildlife, they also know what we as photographers are looking for so they will not waste our time on animals that are too far away or buried deep in the brush. 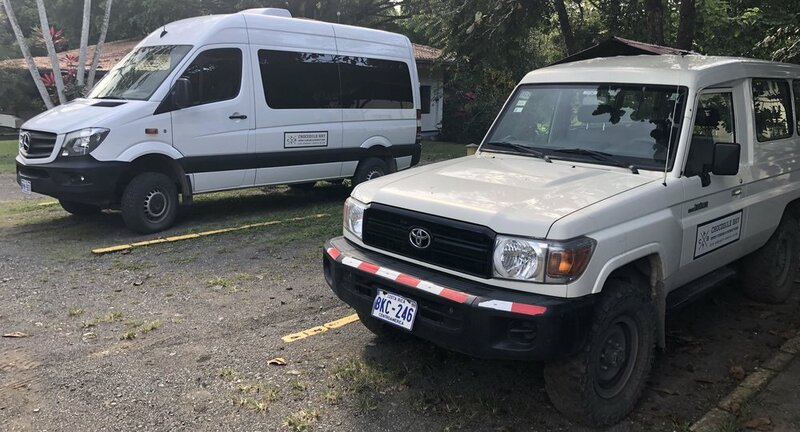 Throughout the week, you will be transported in comfort to every location in either a Mercedes passenger van or in a Land Cruiser as we go in search of wildlife. You will receive lessons in a classroom setting as well as out in the field in the areas of photography, editing, videography or any other areas you may have questions. Day 1: You will arrive in San Jose, Costa Rica where you will spend the first night at the DoubleTree by Hilton Cariari Hotel. You will need to take a small connector plane (included in the package) to reach the Osa Peninsula where we will be staying and as most arrival flights land in the afternoon, the connector planes are not available until the next morning. Day 2: On the morning of day 2 you will be transported by plane to the private airstrip located just off the resort grounds. Once you land, you will be shuttled down the road to the resort where we will meet you and get everyone checked into their rooms. Once that is finished we will have an intro meeting in the conference center to introduce everyone as well as giving you as much info as we can to prepare you on what you’ll need to know so that you are ready when the time comes to get the shot! We will then do a tour of the property. After lunch we will end the day with our first adventure off the resort at a nearby location where its possible to see birds, monkeys, sloths and even some great views of the landscapes as we will be at higher elevations. Day 3: On day 3 we will visit a location in the morning to do some macro photography (if you don’t have a macro lens, that’s okay, this will be discussed more in depth in the gear section below). At this spot we will likely be photographing frogs, lizards, snakes and butterflies (possibly other insects as well) depending on what is found. This is normally our first opportunity to photograph the iconic red-eyed tree frog. We will then head back to the property for lunch and spend some time photographing whatever we find on the resort grounds before ending the day with some class time to review images and go over any areas where we feel teaching may be needed or requested by you. Day 4: Day 4 will be a full day off the resort. We will head out into an area where pretty much anything is possible to see. 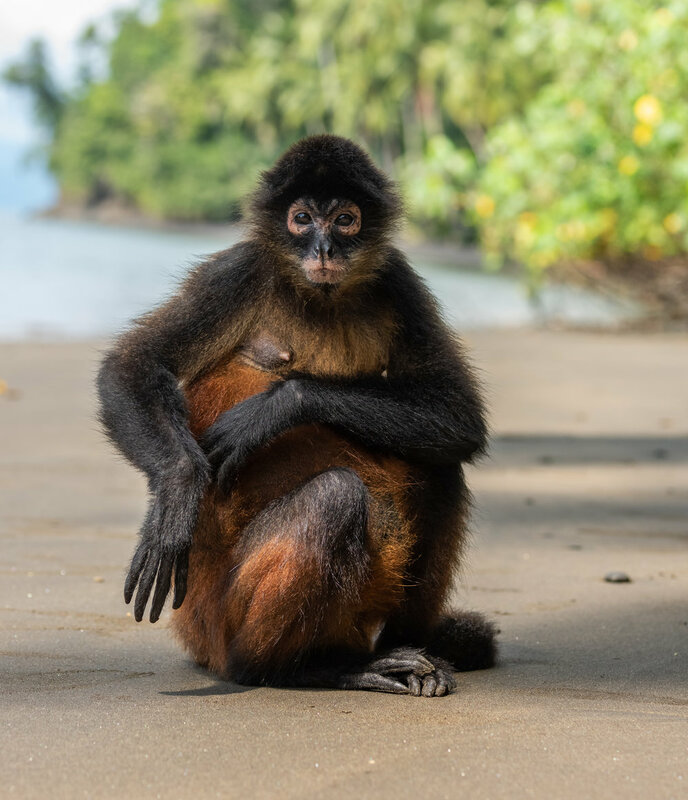 Possible animals that we may encounter here would include: all 4 species of monkeys, hawks, caracaras, owls, macaws, tiger herons, and and many other birds. Lunch will be provided while we are out in the van as well as snacks and drinks. You will place your order the night before at the resort so no need to worry about food. Day 5: On day 5 we will head out on a pontoon boat to get a different perspective of the animals as we float down the calm river water for the majority of the day. Possible animals we may see here would include many types of birds, monkeys, lizards, crocodiles and possibly even an owl as well as bats. We will finish up the day after lunch back at the property to have either some free time to explore the property grounds or some 1 on 1 time with both Sean and I if you need some extra work in any areas. Day 6: Day 6 will be another macro session with the reptiles and amphibians where we’ll have a second chance to apply what we learned from the previous session. Possible species will include tree frogs, poison dart frogs, venomous snakes (don’t worry, there will be an expert snake handler there to make sure everyone stays safe) and lizards like the basilisk which is nicknamed the “Jesus Christ Lizard” as it runs on water. Time permitting we may make a special stop on the way back to the resort for a chocolate tour that will be an insight to the local culture as well as an opportunity to possibly see more wildlife on the property. Day 7: Being that this workshop is a full schedule, the morning of day 7 will be left as free time in case a prior even would need to be rescheduled for any reason, or just some time to relax. There are many options that the resort offers such as zip lining and more…this would be an opportunity to do any of those types of excursions (at your own cost). Or you can spend the time photographing the animals on the property. In the afternoon we will head to a beach that has beautiful landscape photo opportunities as well as wildlife in the area. While there, we will have an option to hike to waterfall for more landscape photos or those who do not want to hike up will have the option to remain at the beach. Having 2 instructors provides us the ability to split the group if necessary. Day 8: The final full day will be start by taking a short boat ride across the bay to a location only accessible by boat. We will be visiting a sanctuary here with some animals that are wild along with others that cannot be released back into the wild. We will have a very unique experience here that you probably won’t ever forget while being very close with the animals! Once finished here, we’ll head back to the resort and finish up our last day photographing on the resort grounds along with taking care of anything that may need to be done before leaving. Day 9: Departure flight back to San Jose for your return flight home. Weather permitting, on a clear night we will also have a night shoot at least one night where we will set up lights for things like frogs in the dark which are nocturnal species. Requirements to join: This trip is open to any skill level from beginner to professional photographers. Having multiple instructors we are able to assist those who are newer to wildlife photography that may need the extra help. The rainforest is a challenging place to take pictures at times and can be fast paced but we are here to help! Physically there is not a lot of strenuous outings in terms of hiking or climbing as the majority of the time will be spent driving and stopping as we see things but the days are long and fairly hot at times which can be physically draining. It’s important to stay hydrated while visiting here and drinks will be provided. Much more….this are just a few examples! Camera body or two if you have them to be safe. Long lens - while there are times some of the animals will be close, I would recommend at least a 400mm lens. 500mm or 600mm is ideal. I use a 600mm and also bring an 80-400mm lens for times the 600mm is too much. Wide angle or 24-70mm lens. There will be a couple of landscape photo ops if you’re interested in capturing those. I strongly recommend a macro lens for the reptiles and amphibians but if you don’t have one or do not choose to rent one, something like a 70-200mm lens, or the Tamron/Sigma 150-600mm lenses will work in place of the macro just producing different results. Flash if you have one, recommended but not required. Rain cover of some sort for your equipment as well as a lens cloth. It is humid here and does rain at times. Laptop to back up photos and to participate in lightroom and photoshop lessons. Again not required but is beneficial. Lots of memory cards and batteries! There is a tag along option for an additional fee if you want to bring a spouse/guest however they will not be able to participate in any of the workshop activities. There are plenty of other options the resort has for your guests at additional costs. The resort also has a spa and is not far from the beach. All meals while at the resort including lunch that is provided on days we are not returning to the resort at lunch time. Excess baggage fees, the connecting flight has different requirements than the major airlines. These generally are minor charges. Any optional excursions not included within what is listed above. It can be very hot and humid here so pack accordingly. There is also the chance of rain so remember to bring clothes that dry fast and/or rain jackets for yourself and camera gear and sunscreen if needed. I wear both long pants and shorts. We do not venture too far off trails. You will also want bug spray. The bugs are not nearly as bad as I expected but better safe than sorry. You do not need to speak Spanish. The area is very safe, don’t worry about that. We will spend a fair amount of time in vehicles so if you get motion sickness I would bring medicine.